Like to Sing and Dance? Play an instrument? This is the place for you!! 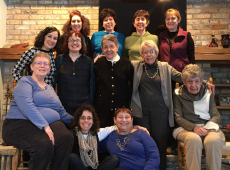 Adult Choir: Join the choir for once a month Shabbat Service and High Holiday worship. CEEBJ Band: Bring your instrument and play several times a year for a Shabbat Service or selected special events. 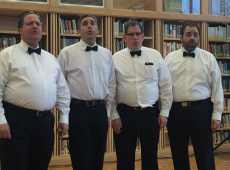 Purim Spiel: Cantor Barash sets up the Purim story to a famous musical. We start with an open invitation in January to join in the fun, followed by weekly rehearsals with the big megillah performance du ring our Purim celebration. Annual Variety Show: Show off your major or minor talents! You can sing, dance, play an instrument or even bring in your dog to show off its tricks. This event is usually held in January. Contact Cantor Barash for more info: cantor@ceebj.org or call (414) 228-7545. Come to play, have lunch and join in a raffle. All levels are welcome. We meet on the second Tuesday of selected months; check our calendar for actual dates. For more information, contact Sara Cherny at sara.cherny8@gmail.com. This Women of Emanu-El group tirelessly knits chemo caps, prayer shawls, and baby caps for donations to organizations in Milwaukee in need of these items. New knitters are always welcome to join us. Check our calendar for actual dates. Contact Brenda Safer at 414-462-5367 or by email at saferbrenda@sbcglobal.net. The Tuesday Book Club meets on the third Tuesday of the month at 1:00 pm for discussion (and some noshing). Contact Gail Pittelman at (414) 357-6424 for more information. The Sunday parent’s book club meets every other month during Sunday School from 9:45am to 11:30am. Contact Dana Michael at danamichael44@yahoo.com for more information. This widely popular adult program brings together Milwaukee area newcomers, semi-retired and retirees to an event which provides a delicious kosher lunch and a stimulating and entertaining program. Strength is an appropriate word because KOACH reflects the vigor of this region’s Jewish community by representing the JCC and six Milwaukee synagogues including: Congregation Beth Israel Ner Tamid, Congregation Emanu-El B’ne Jeshurun, Temple Menorah, Congregation Shalom and Congregation Sinai. In this unique partnership, programs rotate monthly between the JCC and the synagogues. KOACH activities are open to everyone and are listed in the monthly Ha-Kol and our website calendar. For more information about KOACH, contact Diane Sobel, (414) 967-8258. Questions? Call the main office at (414) 228-7545.